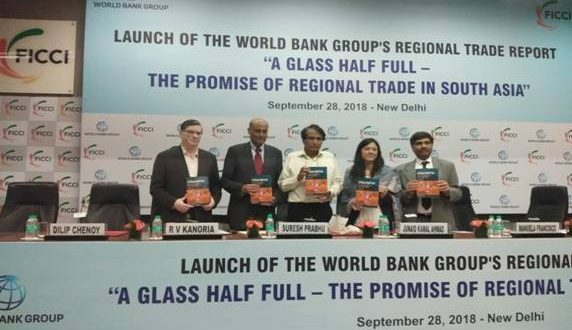 Newdelhi:28/9/18:Union Minister of Commerce & Industry and Civil Aviation, Suresh Prabhu, launched the World Bank Group’s regional trade report “A Glass Half Full-The Promise of Regional Trade in South Asia” at a seminar organised by FICCI in New Delhi today. Speaking on this occasion the Minister said that the potential for intra-trade growth in South Asia region has not been fully tapped as yet. The Minister further stated that during his recent trip to Bangladesh talks on boosting trade between the two countries were discussed and Bangladesh Trade Minister along with a delegation has been invited to India to discuss trade and investment potential between the two countries and India and Bangladesh are already working on a Comprehensive Economic Partnership Agreement (CEPA). During the Minister’s recent visit to Bangladesh it has been decided to set up seven border haats some of which will start immediately. The Minister further added that the potential of services sector is yet to be explored in this region. Deeper regional trade and connectivity can reduce the isolation of northeast India, give India better access to markets in East Asia, and allow it to substitute fossil fuels by cleaner hydropower from Nepal and Bhutan. Trade between India and Pakistan is a paltry USD 2 billion. The book shows that without artificial barriers, this should be USD 37 billion.